City of Tacoma » Government » City Departments and Offices » Community and Economic Development » Local Employment and Apprenticeship Training Program » When Does LEAP Apply? 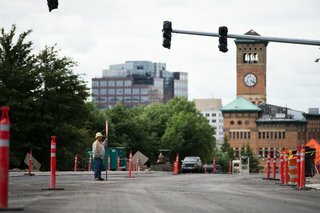 The mandatory program requires contractors or service providers to employ City of Tacoma Residents, residents from Economically Distressed Areas of the Tacoma Public Utilities Service Area, or Registered Apprentices approved by the Washington State Apprenticeship Council (SAC) that reside in Pierce County for 15% of a project's total labor hour goal on qualifying public works contracts. The 15% goal is based on work performed. This goal is called the Local Employment Goal. For larger projects that cost more than $1,000,000, there is also a 15% Apprentice Utilization Goal. Contractors may use a local apprentice to satisfy both goals at the same time. The City requires prime contractors to recruit and hire SAC's and/or city of Tacoma residents, see exception below. Contractors present their Prime Contractor LEAP Utilization Plan for meeting the 15% LUG at a pre-construction meeting. The Contractor can use subcontractor hours toward meeting the goal and the contractor must provide a LEAP Employee Verification Form (LEVF) for every person from whom the contractor will claim credit. Contractors who do not meet the goal are assessed an amount for each hour that is not achieved. The City of Tacoma may waive the penalty if in the best interest of the City. If the project is located within an area that has infrastructure for but does not receive services from Tacoma Public Utilities, then Local Employment goal is waived and the project may meet the 15% Apprentice Utilization Goal with approved apprentices from anywhere in WA State.